There’s something about Norse Mythology that lends itself so well to this hallowed genre we love. Its got cool names like Thor and Odin, titles like God Of Thunder, badass animals like wolves and ravens, unpronounceable words like Mjölnir and Yggdrasil. There’s epic battles, dwarves, giants, beautiful virgins, and it’s all based in pagan folklore, uncorrupted by Christian ethics. Hailing from Italy, BÖLTHORN, who take their name from Odin’s maternal grandfather, a frost giant, is predictably an Extreme Metal band that drinks from this deep well of cool ideas and matches it with Melodic Death Metal sensibilities, like clean singing and Djent-ish riffing, to create some top-notch hybrid Viking Death Metal. The obvious comparison to be made is AMON AMARTH, as a song like “Thor” seems to be straight out of their wheelhouse, with its furious down-tuned open string riffing and charging melodic quality. The execution, however, is flawless. Lacking the outright hooks of modern AMON AMARTH, and with a slimmer and more bottom-heavy production, the effect is that, as an album, “Across The Human Path” is a darker and headier listen. The aforementioned clean vocals are used to a great effect in the chorus of “Sentinel”, which goes well with Drake’s bowl-scraping growls throughout the rest of the song. A nice counterpoint scream is also utilized, sometimes in a sort of call-and-response way on the album, similar to classic Johan Hegg. “Curse of Time” showcases the nice bass work of band founder Ironcross, who also played drums on the album. The interplay of the booming bass drum sound with the bass guitar, exemplified in the verse of this track, really makes the album pop from a sonic standpoint. The influence of Folk Metal, and a band like TÝR, can be heard throughout, and especially on the track “Warriors”, which starts with a lonely guitar melody and strings before heading into a plodding reverie. Some minor chords in the chorus give the track added emotion. “Midgaard” has a repeated guitar riff and chugging bass that feels like an ARCH ENEMY b-side. The clean chorus here is more direct and Melo-Death sounding than any track on the album, but overall the heaviness stays in tact. “The Lair of the Beast” showcases some great palm-muted riffing in its verse and a catchy-but-unintelligible chorus. An epic blast beat battle charge three quarters of the way through is one of the many highlights of the album. The final track “The Kaleidoscope” is a beautiful album-ender, with a Prog Metal bent to it, evidenced in the lead riff and Ironcross’ technical drumming in the chorus. A majestic all-or-nothing final minute-and-a-half sets the album sailing towards Valhalla. 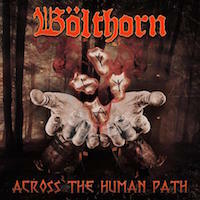 You won’t hear much that you’ve never heard before if you’ve been paying attention to modern Death Metal over the last decade or two, but BÖLTHORN accomplishes a perfect blend of standard Viking Metal tropes with just enough melody and songwriting craft to battle the big boys of the genre. While they might be best served playing up their Folk influences for even greater variety on future releases, for a debut, “Across the Human Path” makes a bold statement.